Why Are Neoliberal Ideas So Resilient? Given the abject failure of the neo-liberal policy offer, why has it persisted as the dominant approach to European policymaking and is there any way out? Vivien Schmidt and Mark Thatcher address this question in an opinion piece for the online think-tank Policy Network. 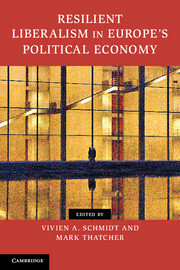 The piece builds on their argument in their co-edited book, Resilient Liberalism in Europe’s Political Economy. Despite the economic crisis that hit the US and Europe full force in 2008, political leaders have made little attempt to rethink the neo-liberal ideas that are in large part responsible for the boom and bust, let alone to come to terms with how immoderate the ‘Great Moderation’ really was. Much the contrary, neo-liberal ideas continue to be the only ideas available. In the financial markets, where the crisis began, reregulation remains woefully inadequate, while the only ideas in play are neo-liberal, either for more ‘market-enhancing’ regulation or in favor of greater laissez-faire. The biggest puzzle, however, is the response to the crisis by Eurozone countries that have embraced ‘market discipline’ through austerity and, in so doing, have condemned themselves to slow or no growth. This is in contrast to the US, which has posted better economic results, despite being torn between Republican fundamentalists advocating austerity and a more pragmatic leadership focused on growth. Our question, then, is: How do we explain the resilience of neo-liberal economic ideas?